DALAKHANI (IRE) (Bay 2000-Stud 2004). 8 wins-3 at 2, Longchamp Prix de l'Arc de Triomphe, Gr.1. Sire of 679 rnrs, 389 wnrs, 52 SW, inc. Conduit (Breeders' Cup Turf, Gr.1), Reliable Man, Integral, Chinese White, Second Step, Seismos, Duncan, Shakeel, Moonstone, Alex My Boy, Defoe, Candarliya, Guardini, Silk Sari, Terrubi, Vadamar, Armure, Centennial, Democrate, Shemima, Gothic Dance, Shreyas, Golden Valentine, Goldwaki, Shemiyla, Deem, etc. French Response (f. by Dalakhani). Winner. See below. Augusta Belle (f. by Not a Single Doubt). Winner at 1400m, 3d SAJC Ubet P.
Liberty Hall (Zabeel). 3 wins from 1500m to 2000m, A$112,335, AJC Euro Finance Home Loan H., Tooheys Illawarra Cup, 2d City Tattersall's Club Cup, L, 3d AJC Spring Champion S., Gr.1, QTC Maxam H., 4th AJC Colin Stephen H., Gr.3. MODERN WONDER (Snitzel). 3 wins-1 at 2-to 1200m, A$201,055, to 2017-18, SAJC Dequetteville S., L, MVRC Ladbrokes 55 Second Challenge H., Synergie H., 2d MVRC Typhoon Tracy S., Gr.3, MRC Telstra Alfred Foundation P., 3d MRC Thoroughbred Club S., Gr.3. OAK PARK (More Than Ready). 4 wins at 1200m, 1400m, NZ$79,650, Rotorua S., L, ARC Crombie Lockwood 3YO S., BOP RC Cronin Cullen Egan Accountants S., ARC New Zealand Herald H., 2d Taranaki RC Energy City Ford H., 3d Waikato RC Norris Ward McKinnon H., Final Touch H., Hawkes Bay City of Hastings Cup, ARC New Zealand Herald H., Rotorua RC Classic Cuisine Catering 2YO H. Producer. INFERENCE (So You Think). 4 wins-1 at 2-from 1300m to 1600m, A$1,023,200, ATC Randwick Guineas, Gr.1, 2d ATC Rosehill Guineas, Gr.1, MRC Toronado at Swettenham 2YO H., 3d VRC Victoria Derby, Gr.1, MRC Caulfield Classic, Gr.3, 4th MVRC Bill Stutt S., Gr.2. RANIER (Lonhro). 2 wins at 1400m, 1600m, A$281,720, in 2018-19, VRC Carbine Club S., Gr.3, MRC Gothic S., L, 2d VRC Maribyrnong Trial S., L, Poseidon S., L, ATC ANZ Bloodstock News H., Tab.com.au H., 3d NSW Tatt's RC Heritage Society H., 4th VRC CS Hayes S., Gr.3. 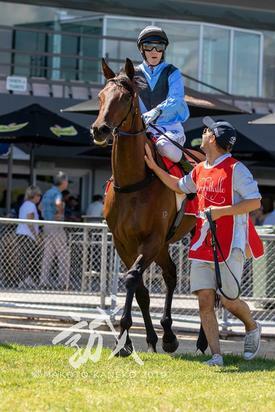 Winner at 1600m in 2018-19, 2d SAJC Adelaide Cup Raceday P.